Rain is a very powerful symbol. Chaucer makes it, in fact, the great protagonist of the very first lines of his Prologue to the Canterbury Tales. It’s April and the “sweet showers “ have soaked deep into the dry ground to water the roots of the flowers. The combination of this spring rain with Zephyrus, the god of the west wind, is so powerful that the “tender shoots” are quickly transformed into “buds” under the eyes of a “young sun” and with the background music of birds singing. It is the joyful natural rebirth which also stirs man’s spiritual rebirth. That’s why spring was symbolically chosen as the perfect time of the year by Chaucer and his pilgrims to set on a pilgrimage to Canterbury to visit the shrine of Thomas Beckett. Chaucer, therefore, gives us an image of a man totally integrated and in harmony with the world and its natural forces. But that was more or less seven hundred years ago. When The Waste Land was published in 1922 , the world had just witnessed the horrors and follies of World War I and what remained in the present was perceived only as a “heap of broken images” on a “dead land “. Among the ruins of the certainties and values of a glorious past, Eliot’s modern man is at loss, he is a “dried tuber” forced to live a meaningless life. Therefore, the coming of the joyous spring produces a rather depressive mood, if man finds no reasons to live. What’s worse, if you have ever experienced such a state of the soul, than somebody that lightly tells you how wonderful life is, but you can’t see it? It is not. It can’t be. Eliot’s world is, in fact, deaf to the seasonal call to life. The feeble rain, which makes its presence in the first lines of the poem as in Chaucer’s Prologue, has, however, lost its invigorating power either on nature and on man.The drops of water try to stir the roots that seem to rest safely covered by the “forgetful” winter snow, but they are “dull“, hence, unwilling to put their heads out of the ground. That’s why April for Eliot is “the cruellest month”: man must emerge from his hibernation only to live in the desolate“stony rubbish” which is the present without the smallest idea of where to go and what to do. Eliot’s modern man, in fact, walks in circle and fixes “his eyes before his feet”, as there is no future to pursue. Having celebrities for parents is often regarded as an advantage both social and economical, but it cannot be denied that sometimes the load of that popularity is so suffocating to make arduous find the necessary room to develop your true self: expectations are high and the oppressive ghosts of parents’ personalities or even faults shadow your being at the eyes of people. It’s like living unseen under a veil of opinions and prejudices, hence you must be endowed with a great temper if you want to tear it, otherwise the chances of prevailing as an individual in order to determine your fate will be just a few. Despite their flaunted anti-matrimonialism, Mary Wollstonecraft and William Godwin had tried to preserve their daughter’s respectability at the eyes of people resolving upon marrying; nonetheless the shadow of her controversial origin was to be a permanent fault in her life. Yet, even if good society seemed to be proof against the tremendous winds of a revolutionary age, William and Mary had succeeded in inflaming with their radical, outrageous ideals the minds of an entire generation and Percy Bysshe Shelley was one of their most fervent admirer. So when Shelley, who had soon joined Godwin’s circle of intellectuals, met Mary the first time, what exactly did he see? A charming young lady of sixteen or the perfect, fascinating synthesis of the ideals of such incredible reformers? The answer is in his dedicatory stanza to The Revolt to Islam (1817) where he writes : “They saw that thou wert lovely from thy birth, / Of glorious parents, thou aspiring Child” , hence she had been singled out by birth for great literary accomplishments and at the same time had to be the perfect product of her parents’ theories : a free cultivated young girl devoid of that prudery that characterized the customs of the age, therefore emancipated enough to accept him as her lover even he was already married with children. Shelley was so obsessed by the memory of her mother that took Mary almost daily to St. Pancras Church to visit Mary Wollstonecraft’s grave and It’s there that he and Mary, rumors whisper, had their first intimate encounter. When William Godwin, who had become much more conservative in time, discovered the liaison, forbade her to see him and virtually kept her under house arrest (having a teenage daughter meant trouble even in the early nineteenth century). After a lot of drama and also Shelley’s attempt to suicide, she eloped with him and we know well, as dear Jane told us, what were the consequences of an elopement in society and with a married man. In fact the life of these free spirits wasn’t to be that simple. 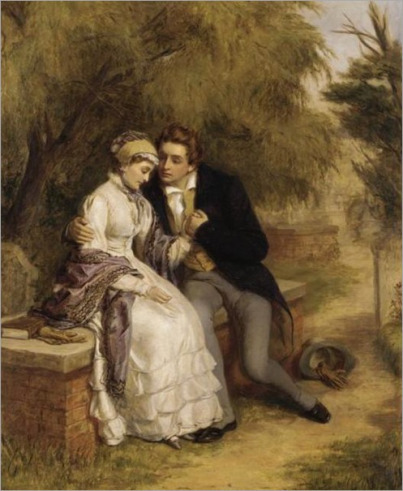 The eight years Mary and Percy spent together were characterized by romance and a lot of melodrama: travels, love, free love but also poverty, births, miscarriages, deaths, suicides and even matrimony to grant legitimacy to their union and offspring, just like what her parents had done. In the introduction to 1831 edition of Frankenstein Mary Shelley goes back to those times and in particularly to 1816, when she moved into a chalet on the banks of Lake Geneva, near Villa Diodati, where Byron and his physician, William Polidori, were staying to tell “How (…) a young girl, came to think of, and to dilate upon, so very hideous an idea” . Indeed, she was a reckless young girl when she conceived her novel, but this introduction was written by mature woman of about forty hardened by the events of life, who could see better the contradictions of her past. She could see how abruptly her choices had turned her world of childish fiction into a harsh reality and in this world Shelley was a husband above all anxious to see her “worthy of (her) parentage” in order to “enrol (her)self on the page of fame”. He had incited her to write “not so much with the idea that (she) could produce any thing worthy of notice, but that he might himself judge how far (she) possessed the promise of better things hereafter“. That’s why she had been unable to produce anything and felt that “blank capability of invention”. She had worshipped his mind, which she believed, was “far more cultivated” than hers and this sense of inferiority surfaces every time she refers to her husband or Byron. They were “noble”, “illustrious”, with a” brilliant imagery” more fit for poetry than prose, therefore she took part to their conversations “as a devout but nearly silent listener“. When they all decided to write a ghost story, she experienced once again the frustration for her husband’s expectations: “Have you thought of a story?”I was asked each morning, and each morning I was forced to reply with a mortifying negative.” But one day the subject of one of those discussions among men, where Mary again was merely a silent spectator, touched her mind: scientific experiments, galvanism, Erasmus Darwin’s success in causing a piece of a vermicello to move voluntarily. That very night she dreamt of a ” pale student of unhallowed arts kneeling beside the thing he had put together” ,who had dared “mock the stupendous mechanism of the Creator of the world” giving “spark of life” to a “hideous corpse”: she had her story, she had her chance to be seen. Her veil in a night had been torn away and Mary the authoress of Frankenstein, ready to gain everlasting fame, had materialized. When she died in 1851, she had established a reputation as a celebrated author independent of her famous husband Percy Bysshe Shelley.